Doesn’t this still bruise the hell out of you? Who were these “young women” who let people shoot at them? To demonstrate the effectiveness of a bullet-proof vest he invented, a New York man donned the garment, posed as the target and allowed three policemen to shoot at him at close range. Repeated fire of thirty-eight and forty-five caliber bullets failed to penetrate the vest. 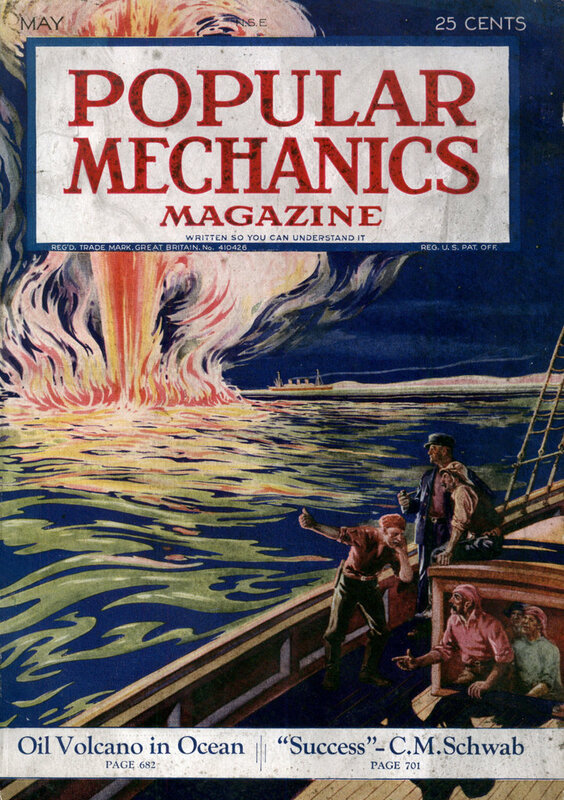 The missiles were flattened against the sides of the protector and fell harmless to the ground. Following this demonstration, young women put on the vests and also served as targets. This is the worst photo-manipulation I’ve seen in ages. Damn you!!! My “I Want To Believe” poster now has to come down, even. And I thought *I* was a sceptic. But I guess us scientists are the easiest to fool, thinking a picture is a picture, since all *our* friends (fellow scientists) don’t tend to fake pictures. I know it’s fake though, since I researched such vest materials, half a century after this blurb. And they don’t let bullets go into bodies, but they still let bullets break ribs, since it’s like taking a punch from a professional boxer, bare-fisted, unless you want it to weigh 85 pounds, which you don’t. There is no way to make a perfect BPV (bullet proof vest), and it will take another 100 years to make it. Saw a kung-foo movie once. They deflected bullets by angling their palms as they arrived. Not as good as The Matrix through, since they kept using the same stupid trick a hundred times in two hours. It’s a real vest. 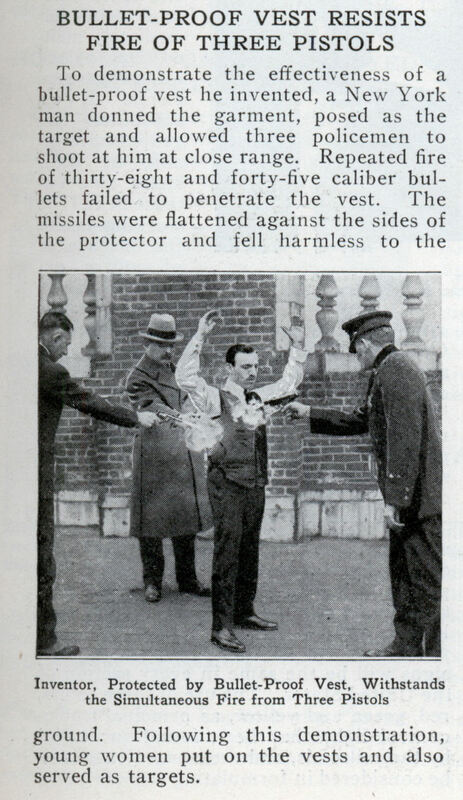 While the picture is a bad re-enactment (The distance was greater than that) the vests from the 1920s and 30s could stop a .38 special bullet fired from ten yards, a .45 acp at sixteen. The old vests used STEEL or DURALUMINUM alowing the wearer to withstand “blunt action trama”. early bullet resistant vests used either magnesium or pressed paper plywood panels to stop low velociety rounds. because the whole panel is trust inward at once the bruising is minor if any. However, the problems with this have already been stated. Magnesium is flamable at 400 degees fer. and plywood is heavy and rots. The military and police forces of the US at the time didn’t buy these vests for those reasons. Also they could only defeat pistol rounds like 38. special, a military grade 30-06 would blast right through it. How ever some designs did make it in the army air force during WWII as flak jackets. this is why the invention first (true) bullet resistant vest is credited to Second-chance body armor for its use of Kevlar panels. Alan McGowan: Magnesium or pressed paper plywood panels? I’m familiar with cotton wadding in the 30’s and aluminum or steel reinforcement but I’d need to see a source for the ones that you were talking about. As for Richard Davis inventing the first bullet resistant vest (true or otherwise) in 1976 I think that the National Institute of Justice, the American Body Armor Company and Richard A. Armellino might have something to say about that. Note Mr. Armellino’s patent here http://www.google.com/p…. Second Chance gets the credit for the first all-Kevlar vest. Still wouldn’t stop rifle bullets though, so I fail to see your point. One point that you missed in your scholarly essay was that in 1924 the US military wasn’t buying much of anything much less body armor!